Those who know me know I love to dance. Whether it’s a friend from childhood who put up with my endless choreography of every song on every Compact Disk I ever received, a high school boyfriend who planned dates around competitions and sat through lengthy dance recitals, or a friend from university who understood that 2 a.m. didn’t mean the end to my dance party, I have afforded myself a reputation for shaking it. We, the collective nutshellers, also love helping a good cause any way we can. This combination of passions led us to enthusiastically lend our support to the Children’s Hospital of Eastern Ontario’s (CHEO) upcoming Dance Marathon (DM). The DM movement, invites students from across the country to dust off their dance shoes for a good cause. One hundred per cent of the funds raised go towards CHEO, and in 2014, its first year, raised over $32,000 for kids in need. The fundraising, which has already been going on in local colleges and universities, culminates with a six-hour long event where participants interact with patients from CHEO while staying on their feet, dancing and playing games, on behalf of those who’s illnesses won’t allow them to. The motto says it all: “Dance For Those Who Can’t”. 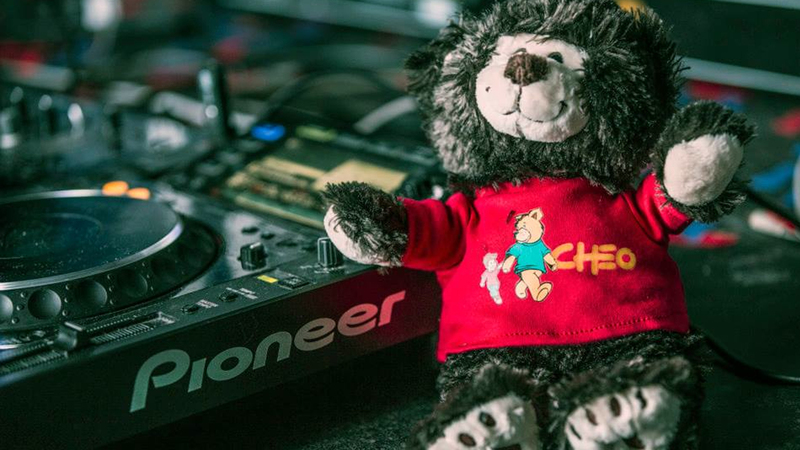 CHEO is a partner in the Children’s Miracle Network, which is a non-profit organization that raises funds for more than 170 children’s hospitals. They are the only national children’s charity committed to having 100% of the funds raised stay local to support local kids. There’s where it gets personal. I speak on behalf of all of the Ottawa nuts in saying CHEO holds a near and dear place in our hearts. We all visited, or had a sibling, relative or friend use CHEO’s services growing up, and—if we continue to raise our families’ in this city—will want our kids, and their friends and our friends’ kids to have the same access. 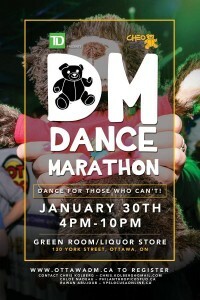 The CHEO Foundation, in collaboratin with DNA Presents and Ottawa Venues, will be hosting the second annual Ottawa Dance Marathon this Friday, January 30, at Liquor Store Party Bar & Green Room (130 York Street), in the heart of the ByWard Market. Follow along as @inanutshellca @LiquorStoreBar & @backchat_media live tweet the event!